Iron Man (2008) turns 10 years old today. It’s a film that has spawned 18 sequels and counting, a fact that is more impressive considering the fact that Robert Downey Jr.’s ninth outing as the character debuted last week. Today Iron Man is known as Marvel’s franchise sleeper, and countless articles have been written about its success. So, today I won’t be discussing the oodles of money it’s made Kevin Feige and Disney. What I will be talking about is how Iron Man has helped to establish a new method of character development. When Tony Stark was revealed to the world in May 2008, he was presented as imperfect. In Iron Man, he’s a reckless alcoholic who uses his vast fortune to go on endless sexcapades. This Tony Stark dates models, drives fancy cars, and looks out for #1. Even the threats he faces are relatively tame by today’s standards. Iron Man battles against terrorists and corrupt corporate execs. Throughout the film, he matures into a reckless alcoholic who uses his vast fortune to build weaponized suits. And while that’s a rather abrupt description of his transformation, I believe it to be a rather apt one. Fast forward to the Iron Man we see in Infinity War. This Iron Man feels remorse, is married, and even has a ward. He’s a father figure and a mentor, the exact kind of person he needed in his cinematic debut. This Iron Man fights evil robots and purple aliens with magic gauntlets. The character is quite a leap away from how he was introduced to audiences in 2008. Both Tony Stark and his world have changed more than that of most franchises do in their entirety. So how has Marvel managed to develop a character this much? Tony’s captivity in Iron Man, coupled with his decision to cancel Stark Industries’ weapons manufacturing. Iron Man’s decision to guide the nuke through the wormhole in The Avengers. 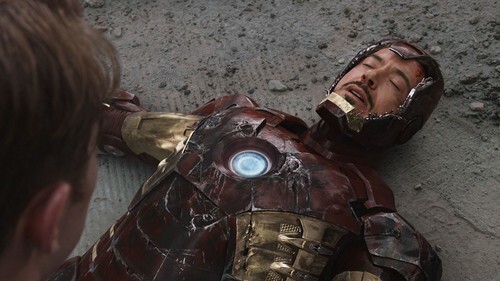 Tony’s decision to blow up the Iron Man armor for Pepper’s sake in Iron Man 3, although this is nulled by Age of Ultron. His decision to take Spider-Man under his wing in Spider-Man: Homecoming. The key is that Marvel hasn’t grown Iron Man through the traditional cinematic methods. There are no training montages or inner monologues (except for maybe Iron Man 3) like in Sam Raimi’s Spider-Man Trilogy. Instead, Tony Stark has grown like a character in a TV show. We as the audience are shown defining and challenging moments in his story. We don’t see the mundane (except for maybe in Homecoming) but are left to fill in those gaps. Take Tony Stark’s arc from Captain America: Civil War to Spider-Man: Homecoming. When we last see Tony Stark in Civil War, he is moping around the Avengers’ Mansion. Having been faced with the truth behind his parents death, Iron Man went to blows with Captain America and lost. When we first see him again in Homecoming, he has become a father figure to young Peter Parker. His signature don’t-care attitude is present, but with a sense of ownership in the youngest Avenger. We never see Tony process the events of the previous film and mature, but we accept that growth nonetheless. Ten years later, we have seen Tony Stark grow because we haven’t actually seen it. Marvel and Co. have done a tremendous job of making their characters ones that the audience can empathize with. That’s part of what made Iron Man a hit. In a summer crowded with superhero movies —Hellboy II, The Dark Knight, the Incredible Hulk, Fantastic Four: Rise of the Silver Surfer, Hancock, and Punisher: War Zone — Iron Man resonated with audiences the most. Robert Downey Jr’s charisma makes Tony Stark more relatable than Christian Bale’s Batman, for example. And, because the character is easy to empathize with, it is also easy to fill in the developmental gaps he goes through. One of the biggest criticisms of Infinity War is that the characters aren’t properly introduced and developed. This criticism is grossly negligent in evaluating the film properly. Infinity War works because Iron Man worked in 2008. Tony Stark’s character has been built on eight additional times since his initial debut in 2008. Marvel banks on the fact that if you’re invested enough to wait ten years for Infinity War, then you’re well invested with each of its characters. This model of compounding growth that is established with Iron Man is applied to each of Marvel’s characters and films. This is how Thor became less of a warmonger. It’s how Hulk learned to stop punching his fellow Avengers. And it’s how Loki died a hero’s death. By compounding character’s experiences and pointing audiences in the right direction, Marvel is able to develop its characters quickly enough to leave extra time for quips, punching, and explosions. So, as Iron Man celebrates its tenth anniversary, take a moment to appreciate the sincerity of the film. Remember that not only did that film pave the way for shared universes and billion dollar team-ups, but that it also revolutionized the way franchises develop their characters. Thanks for reading! What are your thoughts on Iron Man? Comment down below! Wow I cannot believe it has been 10 years! Iron man is a classic! Thank you for this! So THAT’S why I love Iron man so much! Excellent analysis, I don’t think I would have been able to put that together myself. He really does have the same nice, subtle development that a television show character does, and it feels so much more authentic because in real life, there ARE no montages to get a person from A to B with a snap of your fingers and a catchy jam. I can’t wait to see where things go from here with him!